TAMIYA 78020 JAPANESE DESTROYER YUKIKAZE (1/350)! • This is a 1/350 full display model. 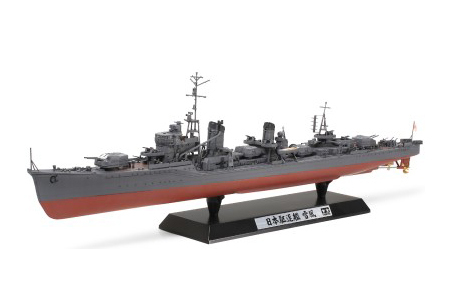 • Model depicts the Yukikaze as she appeared during the 1945 Ten Ichi Go operation (Battle for Okinawa). • Parts included to build a waterline model or a display model with full hull. • It is possible to rotate the guns and torpedoes after assembling thanks to polycaps. • ABS has been used for the masts to ensure strength. • Photo-etched parts are prepared for the ladders, radio antennas etc. • Assembled model can be displayed in the package.